1. It is electrical generation that we do not need. Period. The State of Maine currently generates more electricty than it uses and exports the surplus out of state. Even economic development s that project high growth do not absorb all of the state’s current production capacity in the next 30 years. 2. Industrial wind development in Maine will not replace fossil fuel baseline plants. Due to the intermittent and unpredictable nature of wind for electrical generation, all the megawatts of potential wind power must be duplicated with megawatts from reliable, baseline generation in order for the electrical grid to balance and provide electricity to meet on-demand needs without brown-outs. 3. It is a myth that wind-produced electricity is “free”. Due to the high investment cost compared to the low output, wind-produced electricity is so expensive that in a free-market economy, it would not compete with other sources of electricity; hence, it is expensive, not free. 4. It is a myth that wind-produced electricity is “green”. It is not “green” because fossil fuel baseline plants must be in place and when these are operating at greatest efficiency, they are less polluting. When wind-produced electricity enters the grid, these plants must be throttled back or placed in “spinning reserve” mode, operating at inefficient levels and creating greater pollutants. Isn’t it ironic that when the grid receives kilowatts from wind turbines that the grid is forced to produce more air pollution? 5. Wind turbines do not result in a net “savings” of energy. Because it takes so many wind turbines that produce so little electricity, it actually consumes more energy to manufacture the steel towers and install them than any wind tower will produce in comparable energy in its useful lifetime, which is 20-25 years. Becuase the turbine must continually rotate so it doesn’t freeze up, each turbine uses an enormous amount of petroleum based lubricants. 6. There are severe environmental trade-offs incurred with industrial wind site development. 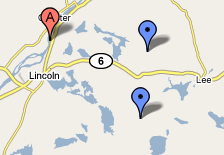 A site like the Rollins project in Lincoln Lakes will consume more than 700 acres of land, an acreage far larger than most Maine farms. It is more than the skiable acreage of either Sunday River or Sugarloaf ski resorts. It entails creating a 3-6 acre clearcut for each turbine site, blasting and leveling, digging down to bedrock and pouring tons of concrete to anchor each 262 foot tower which is topped by a 92 ton nacelle (turbine generator) and 253 foot wide blades. A huge, wide network of roads must be created up to and across ridgelines to get these huge components into place. At Rollins, more than 20 miles of powerlines will be cut. All of the turbine sites and powerlines will be kept cleared by the use of herbicides, effecting dozens of streams, all of the lakes around Lincoln and the watershed of three rivers. Siltation of streams and lakes will occur from erosion from all this construction. Lastly, important wildlife habitat will be fragmented and ruined. Thirty eight residences are within the blasting zones, all on wells, and changes in underground seams of water are a frequent consequence of blasting. Even more acute, however, is the effect of sub-sonic waves from turbines. An unexpected, yet menacing threat to health is vibroacoustic disease. The turbines affect people in these ways: Symptoms include sleep disturbance, headache, tinnitus, ear pressure, dizziness, vertigo, nausea, visual blurring, tachycardia, irritability, problems with concentration and memory, and panic episodes associated with sensations of internal pulsation or quivering which arise while awake or asleep. Source: Dr. Nina Pierpont, Wind Turbine Syndrome: A Report on a Natural Experiment. Is this what we do to people’s lives to build something we do not need? 8. Supporting industrial wind in Maine means supporting the folly of Baldacci’s Wind Task Force, which was a “stacked” group intended to put out what the lobbyists from the wind industry wanted. The ill-conceived and rushed report of the Task Force is now in statutory form. It expedites the permitting process of the DEP and limits public input on decisions that change the landscape of rural Maine. To reach its goal of 2,000 megawatts of installed wind capacity by 2015, the state will have to allow 34 of the projects the size of Rollins to be built. This will entail well over 20,000 acres of land and blast away miles of ridgetops, creating industrial sprawl all over rural Maine, without a single kilowatt being used in Maine. 9. Supporting industrial wind sites will cost you money. There is a disconnect between the Task Force goal of laying waste to rural Maine with industrial wind sites and the users of electricity in Southern New England: the inadequacy of the existing transmission lines through Maine to handle surges of wind energy on windy days. Also, Aroostook County, where many potential sites are located is connected to Canada, not the rest of New England. The answer? A $1.4 billion dollar proposal to upgrade and expand transmission lines. This cost will show up in your Bangor Hydro bill for decades to come. You will pay dearly for something we don’t need and for something for which we derive no benefit. 10. Supporting industrial wind sites supports wealthy investors and corporations raiding the public treasury. According to the US Energy Information Office in 2007, wind energy is subsidized at a cost of $690 million, which worked out to $23.37 per megawatt produced. This compares to federal subsidies of 67 cents for hydroelectric and 25 cents for fossil fuel per megawatt produced. The industrial wind industry would not exist without tax equity financing, production tax credits, double balance 5 year accelerated depreciation, guaranteed access to markets from Renewable Energy Portfolio schemes from the states, and the ability to sell so-called renewable energy tax credits to companies that pollute. It is an incredible array of money making schemes and scams on the taxpayers and ratepayers. Thus, the industry is not about creating “green” energy and saving the planet. It is about how to co-opt concerns about global warming and dependence on foreign oil, and slick propagandizing to position wealthy investors and corporations to get rich as “pigs at the public tax subsidy trough”. If industrial wind sites had to be built with only the usual standards of the free market economic system, there would never be a single one built.